On certain Mac OS X systems (like Snow Leopard), it is impossible to start AWT from rJava started from R.app or from the terminal. Since speedR depends on AWT, it will not run. The solution is to use R and speedR from within JGR http://www.rforge.net/JGR. speedR has 4 sections as marked in the following figure. Object browser: Displays all data objects from the R workspace. 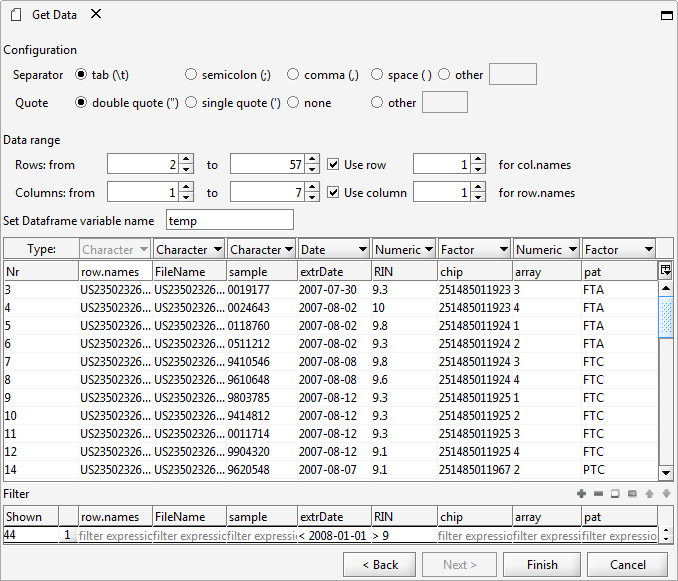 Table panel: Data objects from the object browser can be displayed here. Filter panel: Filter expressions (see the section "Filter Expressions") can be written here. Code panel: Generated R code will be shown here. speedR allows easy access to data in the R workspace by providing an interface to open data from R and to return modified data to R. R objects can easily be accessed via the built-in object browser where all matrices like objects can be opened by simply clicking them. The content of the object browser can be refreshed by clicking the "Refresh" button. The following figure displays the object browser window. Leaf nodes on the tree represent data in the current R workspace. Double clicking on a node makes the data available via the filtering-table. speedR enables data import from a wide range of sources such as Excel (all versions), open office .calc, .csv and .txt files. Unknown data formats will be treated like text files. The importer can be opened by clicking the importer shortcut button located on the right top corner of the "Object Browser" window (see figure above). 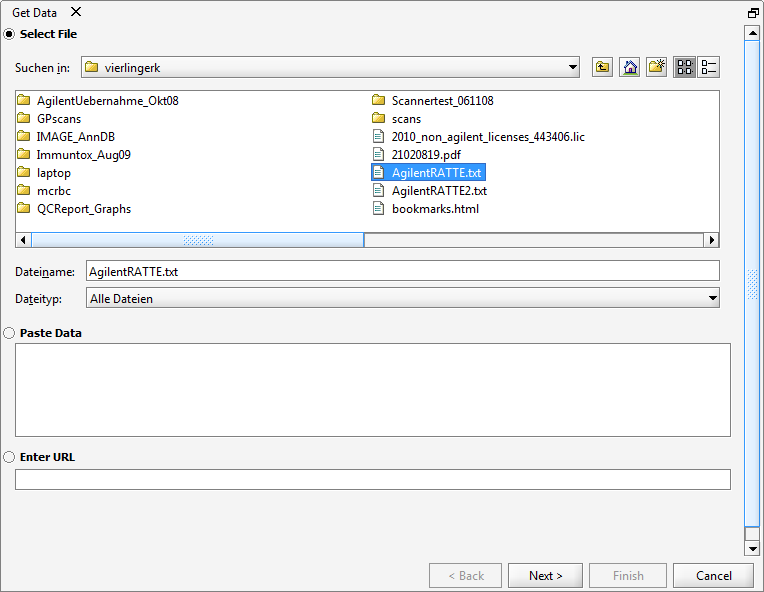 Data import consists of a two step wizard "select data" and "edit table", the two figures below respectively. The speedR filter engine (see figure below) accepts multiple filter levels which are hierarchically applied to the data, starting with the first filter level. A filter level is defined from all filter settings of the same line in the filter editor. Each filter level is assigned to an editable default color; data matching that filter level criteria are labeled with that filter level color. Hit counts for each filter level are displayed left to the corresponding filter level in the "Show" column (see figure below). 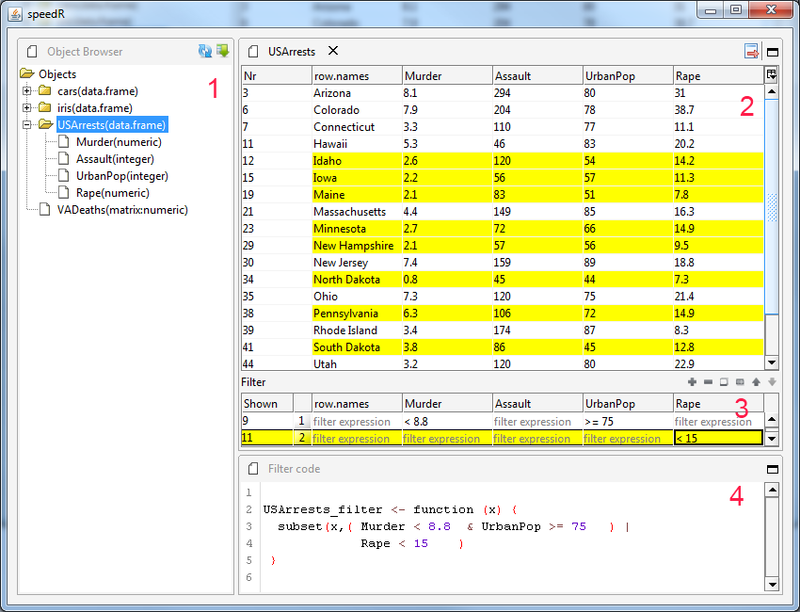 The filtered table can be added to the R workspace or exported to the file system by clicking the export button in the upper right corner (see figure below), the user will be prompted for a variable or file name, respectively. speedR is equipped with a simple expression syntax which makes it easy to write powerful filter conditions. 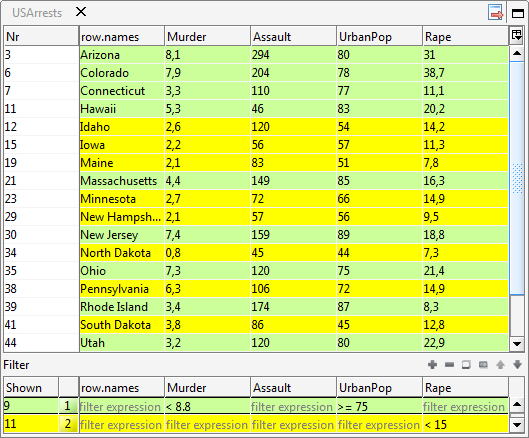 Depending on the data type, proper filter expressions are offered in a dropdown menu when clicking a cell in the filter editor. While writing the filter expressions, speedR translates these filter expressions into an equivalent R function (see figure below). This function uses only function from base package and doesn't depend on speedR. speedR is equipped with a simple expression syntax which makes it easy to write powerful filter conditions. Depending on the data type, proper filter expressions are offered in a dropdown menu when clicking a cell in the filter editor. '<' [value]: Less than a value (number, Date or POSIXct). [value] 'to' [value]: Defines an intervall. Ex. 5 to 10. 'contains' [string]: Selects cells having strings which contains given character set. 'equals' [string]: The cells are only than selected if cell value is equals to the given string. Note that this is case-sensitive. 'not' [expression]: not predicate can be used together with any type of expressions to inverse the sub-expression result. [expression] 'and' [expression]: Expressions may be bound with and keyword. [expression] 'or' [expression]: Expressions may be bound with or keyword. contains "set" and not equal "setosa"
The project summary page: you can find here:.